Happy Taco Tuesday, y’all! Cinco de Mayo is on a Friday this year which means Mexican restaurants are going to be even more out of control than usual. 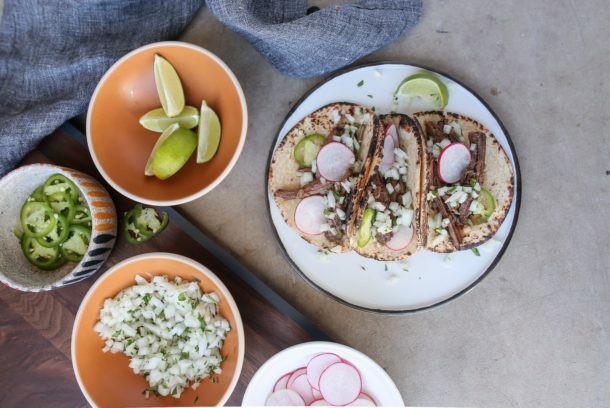 So I will definitely be planning an at-home fiesta and I think you should, too. I’m going to invite some friends over for a DIY taco bar and margaritas. Isn’t that the best invitation — tacos and margaritas?? This recipe has become a new favorite with my friends and family. I actually tasted it and thought it was super delicious and I don’t care for red meat. And because it’s a slow cooker recipe, I will have this done early and not have to worry about it — my favorite kind of recipe! 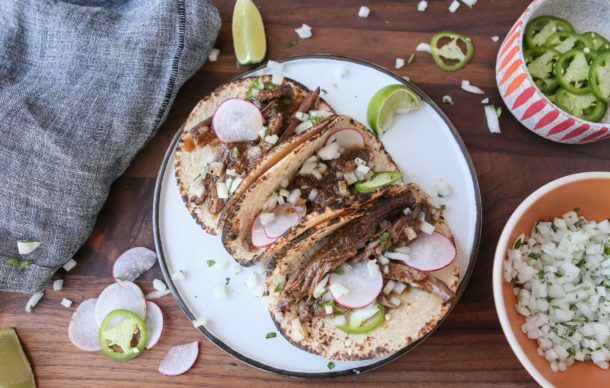 I had to be careful with my wording of the title since this is not a true barbacoa recipe. 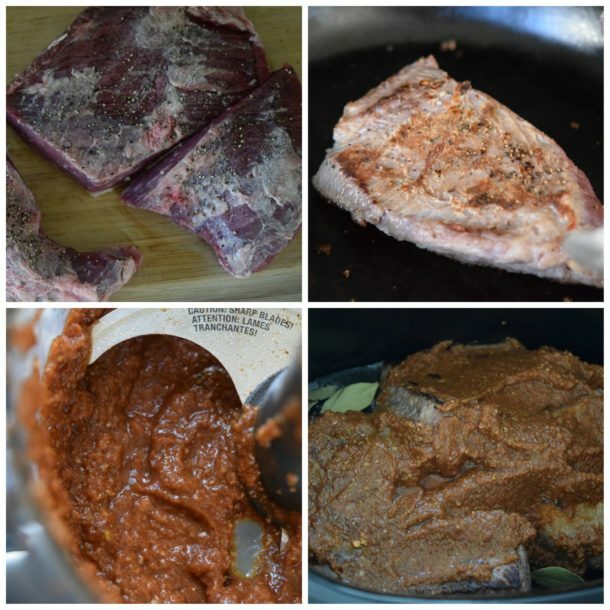 Real barbacoa is made from a cow or goat’s head, although I understand lamb or pork can also be used. The traditional method of preparation involves low and slow cooking in a pit underground. I talked to many people over the years about authentic barbacoa, and like most things, everyone has a slightly different opinion. 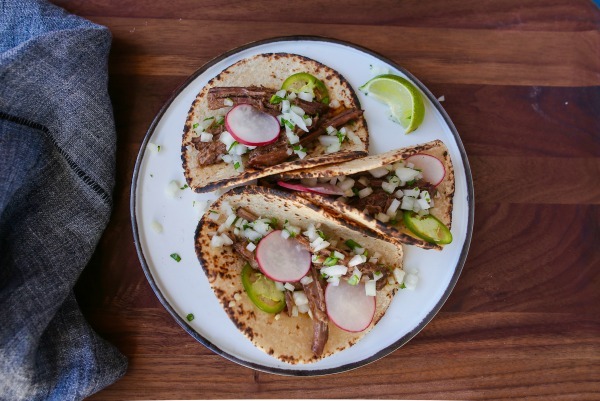 In the US, barbacoa can simply mean meat cooked with spices low and slow until really tender. The barbacoa at Chipotle is a popular menu item. I can’t say that I’ve had it, but it is made with beef (not from the head, mind you) and cooked until tender and shredded. Most people eat barbacoa shredded meat taco-style with tortillas, or in a bowl with rice, beans and salsa. I recently made this slow cooker version for some friends, and they were absolutely inhaling it. I’m talking standing over the slow cooker with saucy, drippy tacos and not even making it to the table. My husband quickly reserved a little so that he’d have it for his breakfast the next day. Even more than in tacos, he loves barbacoa in a scramble with eggs, peppers and onions. If you can, plan on 8 hours in the slow cooker for this. My preferred method is to cook it on LOW for 7 hours, remove it from the slow cooker and shred it, put it back in the slow cooker and stir it with the juices, then cook it on LOW for another hour. At this point, it will be meltingly tender and you can leave it in the slow cooker on WARM until you are ready to eat. This is a great recipe to feed adults and kids alike. I don’t think this is a spicy recipe at all. In fact, if you want it to be spicy, I would double the chipotle powder. If you want to double the recipe to feed more people, the cook time would be the same, but I would turn the meat halfway if possible so all the pieces are in the liquid for equal time. More recipes for your fiesta coming soon! If using brisket, cut into 3 large pieces. Pat the meat dry on both sides with paper towels. Season both sides with 2 teaspoons of salt and a generous amount of black pepper. Heat oil in a heavy skillet over medium heat and brown the meat on all sides, about 5-8 minutes, depending on the cut you are using. 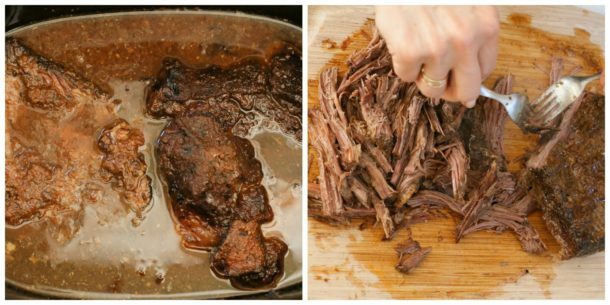 Transfer the meat to a slow cooker. Place the onion, garlic, cumin, oregano, chipotle powder, allspice or cloves, tomato paste, lime juice, vinegar, ½ teaspoon of salt and a few grinds of black pepper in a blender or food processor fitted with the metal blade. Process until smooth. Pour over the meat in the slow cooker. Add the stock and bay leaves. Cover the slow cooker with the lid and set on LOW for 7 hours. After 7 hours, transfer the meat from the slow cooker to a cutting board. Scrape excess fat off the meat and discard. Shred the meat with two forks and put it back in the slow cooker to mix with the juices. If you have time, allow the meat to cook on LOW for 1 hour more to get even more tender. Serve with desired accompaniments. This can also be made 1 day ahead and stored covered in the refrigerator. The next day, remove the hardened fat at the surface of the container and discard. Reheat in a large skillet or saucepan. Hi! Do you think it will be ok to use flank steak? Chuck has great flavor but a little to much fat for cleaning… which my kids will make me do.. I was thinking of making this on super bowl.. thanks! Hmmm, I’ve never tried it with flank steak. It’s a pretty thin cut for the slow cooker. One of the other commenters did this with try-tip and had a great result. How about tri-tip? I’m making it today with a trimmed chuck roast!! The house smells amazing! Everyone coming over for Super Bowl and hopefully will love the taco bar I’m setting up!! They’re going to LOVE it!! Oh my gosh! I made it with tri tip tonight (as Grow did not have chuck roast). It was a complete hit!!! My kids devoured it. Even I couldn’t resist seconds… Thank you! So glad to know you had success with try-tip. Thanks for letting me know, Kelly! Hi Pamela! I love your recipes. How would you recommend cooking if I don’t quite have 8 hours (more like 6 – 7)? You can do it for sure in that time, but it’s just a smidge more tender in 8 hours. It will still be fantastic! The chuck I purchased at the store is tied with string to keep it together as a roast. Should I cut the string and cut into smaller pieces or leave tied as a large piece ? I made your Barbacoa Style Beef Tacos on Sunday for a dinner party of 12. I doubled your recipe and there was enough leftover for lunch yesterday. Everyone raved how delicious! It sure makes it worth all the effort when the cook is praised during and after the meal!! The guests were still talking about how yummy the tacos were the next day!! I don’t have a slow cooker. Can this recipe be made in a Le Creuset instead? Timing? Changes to recipe. Thank you. Love you website and your recipes!! Well, I am going to guess and say you can make this on a covered Dutch oven or roasting pan at 350 for 3 1/2 hours. That’s how I make my non-taco brisket. You’ll probably need a little extra liquid though.I would suggest doubling the stock and being careful not to let the meat dry out. Please note, I am guessing here! Hi Pamela – these look amazing! Did you just warm up the tortillas on a pan on the stove? Thanks, Sandy! If I only have to heat up a couple, I’ll use the gas flame on the stove. If I want to heat up a lot, I will use a griddle. A pan on the stove works just fine, too!